If the Mormon Church wants to operate a political operation they should have to do so without the benefit of tax-exempt status. 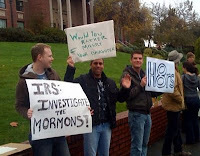 Write your representatives in Congress and demand that they work to have the IRS investigate the Mormon Church. The Religious Violence of "Defending Marriage"
Merriam-Webster Changes Definition of Marriage. Are the Culture Warriors Waning?